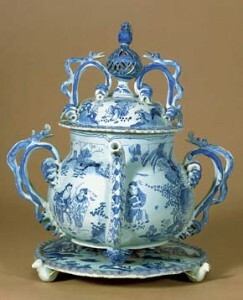 ‘The Thin Blue Line – variations on the ‘Ming Vase’ from the Fitzwilliam Museum. Thursday 10th October 2013, 7.30pm at The George Hotel, Swaffham. From willow pattern plates to ginger jars, blue and white wares have enjoyed an enduring popularity in Europe since they were first imported from China in around 1530. Commonly referred to as ‘Ming’ ware because they were first imported during China’s Ming dynasty (1368-1644), they were produced by painting a design in blue cobalt oxide onto a body of raw (or unfired) porcelain which was then glazed and fired at around 1400 degrees Celsius – and soon became so popular that potters in Holland and later in England began to produce their own lines at less ruinous prices for the mass market. Through the collections at the Fitzwilliam Museum, this talk explores the history and stories behind this most familiar of decorative styles, tracing the journey of the ‘thin blue [cobalt] line’ from its source in Persia, eastwards to China and westwards again to Europe. Mrs. Tao-Tao Chang is International Development Officer at the Fitzwilliam Museum.